Homebuilder confidence is bouncing back. One month after an unceremonious dip highlighted by poor sales figures and dim prospects for the future, the National Association of Homebuilder’s Housing Market Index rebounded two points to 15 in July. The monthly Housing Market Index is scored on a 1-100 scale. Readings above 50 indicate favorable conditions for homebuilders and the “new home” market. Readings below 50 indicate unfavorable conditions. The Housing Market Index has not read higher than 50 in more than 5 years. As a housing metric, the HMI is actually a composite of three separate surveys, self-reported by builders. 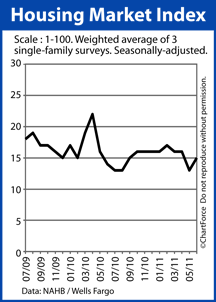 The surveys ask about current single-family home sales volume; projected single-family home sales volume; and current buyer foot traffic levels. The most noteworthy reading is the rapid rise in Projected single-family home sales. Although builders aren’t experiencing more foot traffic, they think sales will spike between now and the New Year. That could spell bad news for Brentwood home buyers. When builders harbor higher expectations for the future, they’re less willing to make concessions for upgrades and/or price. Your likelihood of getting “a great deal” as a buyer diminishes. That’s why it’s good that mortgage rates are still so low. Low mortgage rates help with home affordability and can offset slight jumps in sale price. Mortgage rates remain just above their lowest levels of 2011, and of all-time.